Sampler Detail 3, originally uploaded by tabithaspike. I've been itching to get stitching on this sampler too! You will find it in Jenny Hart's Embroidered Effects and it has 17 different stitches. I'm especially keen on trying the Open Cretan. Sounds a bit like a tennis tournament but it is the lovely red stitch sandwiched between the cross stitch and what I think is a chain stitch. 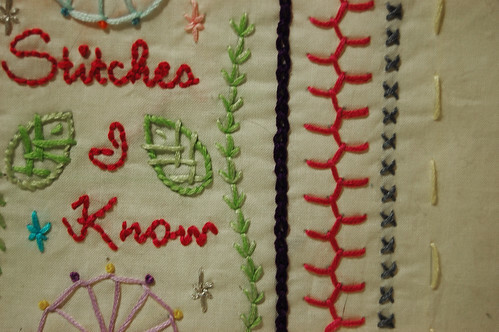 This sampler was stitched wonderfully by tabithaspike. Sigh. Beautiful. Visiting this blog is making me itchy to get stitchy. Aww thanks ;) I love your blog btw!